Season two of the Golden Globe- and Emmy-winning Hulu drama The Handmaid’s Tale is coming this April. The new season will focus primarily on—stop reading if you’re not caught up, by the way—Offred’s (Elisabeth Moss) pregnancy and her being on the run, but showrunner Bruce Miller said in an interview with THR that the season will be unpredictable. This season is off-book, since the story for season one came directly from Margaret Atwood’s 1985 novel of the same name. Miller says he has a whopping ten seasons planned for this story; however, the basis is still Atwood’s novel. The “arc is still very much the arc of the novel, which is the arc of this one woman’s experience in Gilead at this time, and her recollections that paint this picture of what it was like and what the experience of this world was like,” Miller explained to THR. The following seasons he has planned still cover material that Atwood wrote in the novel, but just much more slowly. Atwood, Miller reassures, remains very much involved in the development and production of the show, despite the show going slightly beyond the novel at this point. The new season will most definitely parallel the Time’s Up and #MeToo movements that have rapidly spread through Hollywood and the rest of the world. One of the biggest parallels found in the new season is the uncanny resemblance between the sexual assault in the show and our culture today. Miller further explains this resemblance between the show and the real world, saying, “Inevitably, when you do a show where one of the big aspects is a very, very sharp divide between the role of men and women and the power structure, you can’t help but be pushing up against the same thoughts and ideas that are going on behind this movement.” Miller has made sure that a safe and comfortable work environment is in place on The Handmaid’s Tale, in which people can freely discuss their concerns and deal with problems that may arise head on and together. Every episode in the show’s new season complements each other, with rarely any stand-alone episodes. The second episode of the new season, however, will focus on a related but different storyline taking place in the colonies, and will feature Oscar winner Marisa Tomei. It’s rumored that Tomei’s character will be a recurring guest star. Most of all though, the season will primarily focus on Offred and the journey ahead of her, with everything else relating to her central storyline. Season one was a massive success for Hulu, winning the Golden Globe and Emmy for Best Drama Series, and winning the Golden Globe and Emmy for Best Actress in a Drama Series for Moss. The show has been a centerpiece in inspiring protests throughout the world, with many of the protestors wearing the iconic handmaid’s uniform. The story details Offred’s experience with losing freedom over her own life in the dystopian nation of Gilead, where men wield control over women. 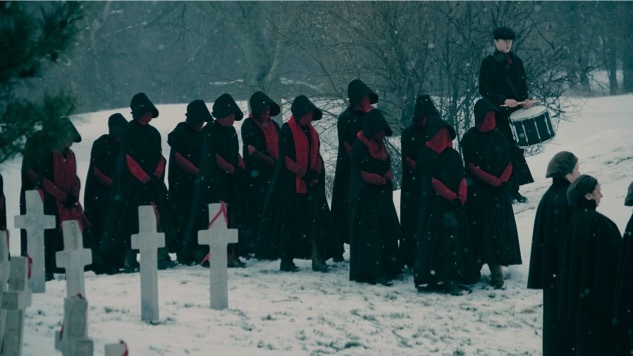 Check out the first teaser for season two of The Handmaid’s Tale below and find out what you need to know about the forthcoming season of the show here.